An exceptional, fine and impressive antique George V English sterling silver argyle; an addition to our dining silverware collection. This exceptional antique George V sterling silver argyle* has a plain cylindrical form. The body of this silver argyle is plain and unembellished, with an applied moulded border to the upper and lower rim. 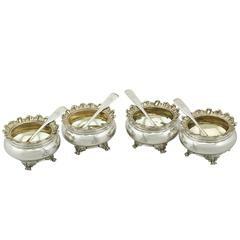 This impressive example of antique silverware is fitted with a hallmarked domed push fit cover surmounted with a cast silver circular urn style finial. The cover is further ornamented with a band of cast and applied gadroon decoration to the rim. The argyle is fitted with the original carved cherry wood C shaped handle with scrolling thumbpiece and fitted to plain sterling silver sockets. The upper socket it fitted with a hinged cover allowing access to the vessel's heating chamber. 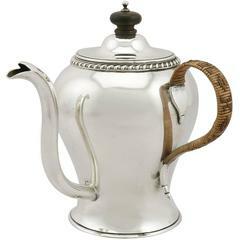 This antique silver argyle has an impressive, plain swan necked spout. This argyle is the finest copy of a period example you could hope to acquire. 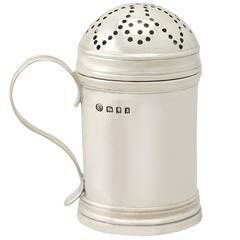 * A silver argyle, otherwise known as a silver argyll, is a gravy warmer; an internal chamber filled with hot water keeps the gravy warm from kitchen to table. The original argyll/argyle was crafted in honour of the fifth Duke of Argyll, John Campbell (1723-1806) and his wife Elizabeth Gunning, Baroness Hamilton of Hameldon. 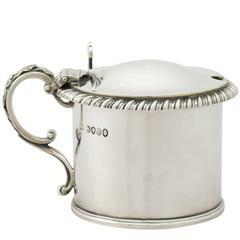 Dimensions: Length from back of handle to tip of spout 18cm/7.1" Width 8cm/3.1" Height 12.2cm/4.8" Weight: 11 troy ounces/342g Maker: William Comyns & Sons Ltd (Richard Comyns) Date: 1934 Origin: London, England Video: A video of this fine piece is available upon request. This antique sterling silver argyle is an exceptional gauge of silver, exceptional quality and in exceptional condition. The interior of the argyle has been professionally cleaned and is ready for use. Full hallmarks are all very clear. A decorative antique sterling silver bowl made in Birmingham in 1907.